At the LGS today, and there was a used Savage model 110 in .223. Pretty stock model, wood stock, standard barrel and whatnot. It looked used, and there were some minor scratches on the wood, but overall it was in decent shape. It also came with some 3x9 scope, probably a junker, but its on there. Out the door for $250. Is this a good deal? I also saw some good prices on some Mausers, less than $300 for some really nice looking guns. I really need to get setup for reloading ASAP so could really take advantage of some less than common chamberings like the 7mm Mauser that isn't really available locally. I was about to say it's a good deal, however, are you sure it's a Model 110 and not a Model 10? The reason I ask is that the 110 is a long action, the 10 is a short. 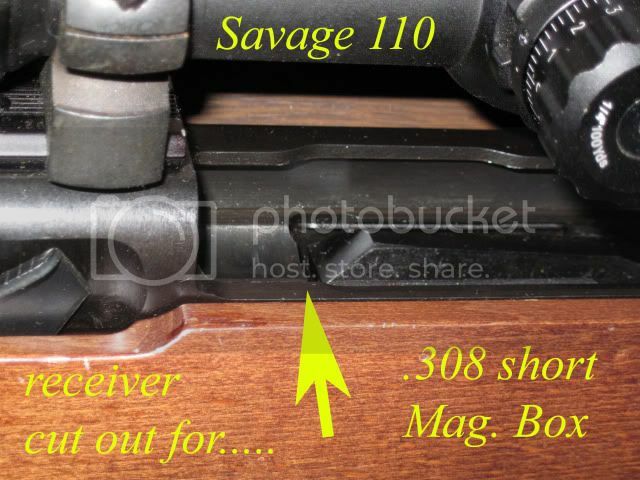 I know that Savage produced some long actions chambered for short action cartridges....but that was quite awhile ago...(I take it it does not have an accu-trigger?) 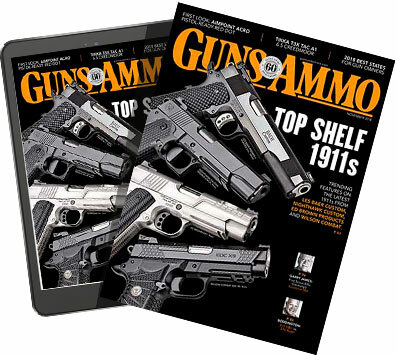 In the end, you have waaayyy more action than is necessary for a .223 cartridge. For that money though, I would swap out the bolt heads and rebarrel it in something more conducive for use in a long action. That's probably a model 10 unless somebody rebarreled a model 110. But a 110 is the long action. I have a Stevens Model 200 in .223 which is nothing but a model 10 without accutrigger. But I worked the trigger and lightened it up a lot. But that is not a bad price if it's in any kind of condition. The Model 200 Stevens goes for a little over out the door about $345 at Wally World, at least that's what I paid for mine back in the late spring. So if it's a model 10 with Accutrigger it is a real good deal. If it's an older Pre Accutrigger 10 or a rebarreled 110, it's probably still a good deal, although not quite as good. I'd buy it for that. See if you can get them to guarauntee it to shoot, just to make sure the barrel is ok. Even at that though the action is worth a couple hundred by itself. Hey good Idea Jayhawker, he could swap the bolt head and have it rechambered for 22-250 or maybe .220 Swift. It would depend on what the barrel length is. 22" is a little short for a .220 Swift or actually somewhat for a 22-250 even, though some factory rifles are made for it in that length. I do believe this to be an old rifle. It certainly looked the part. The tag said 110, but I didn't check the rifle itself. Its pre accu-trigger. The included scope is probably junk, and looked as old as the gun itself. I just have a feeling that this rifle has been "around the block" a time or two, and a modern equivalent could be had for not much more. That's true Funk. Check out the Stevens Model 200. Like I said, you can have one of those out the door at Wally World New for about $350. I got one in .223 myself. Not a bad deal. I understand what you're saying Jayhawker. I told him about the Stevens 200. Not a bad deal in itself. And just because it isn't an Accutrigger doesn't mean the trigger can't be adjusted. I did mine and it worked out great. I have a model 110 in .308 win. and it is a "pre"- accu-trigger model which is also called "flat rear" receiver for scope mount purposes; accu-trigger models are "round rear". I also have a Stevens 110E in 270 win., which is essentially a lower cost variant (if that's possible). 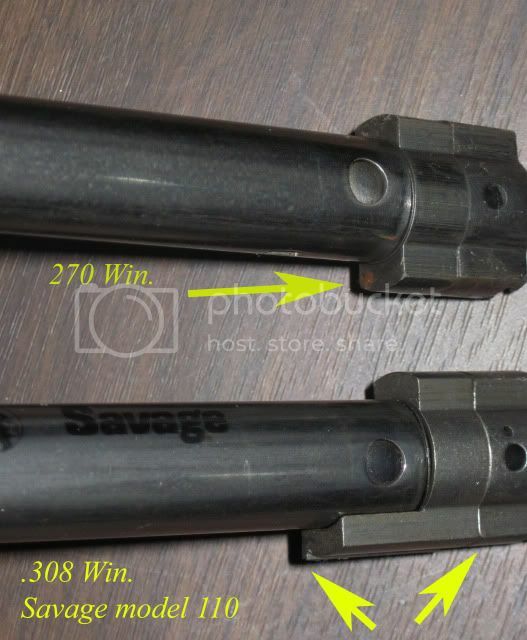 Savage used the same bolt for both long and short action cartridges! The rotating collar behind the locking lugs is definitely different as can be seen in this photo of my two bolts. The rotating "collar" of the 308 bolt has a much longer chunk of steel on the right side that actually acts as a "bolt stop" of sorts. The action opening, however, is the same size as the 270 win., the bolt just doesn't retract as far to the rear. Converting the 308 rifle to a "long action" caliber would entail more than just replacing that rotating collar, however. The opening for the magazine box in the bottom of the receiver is only large enough to accommodate short action cartridges, as can be seen in this photo. There is that...It appears I neglected a couple of technicalities...good catch..
As Roseanne Roseannadanna used to say..."Never Mind!" I would say that it's not a bad deal. The two LGS that I go to are always way better than the pawn shops in my area.